Cup holds any standard round headphone and will stretch to fit various diameters. 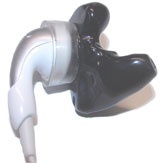 Custom made earmold with cup that holds any round headphone and will stretch to fit various diameters. Secure fit for any standard round earbud or oval iphone EarPods. Earbud will stay in the ear while running, exercising or biking. NOTES: if order is for 2 different persons, place orders in the cart separately.